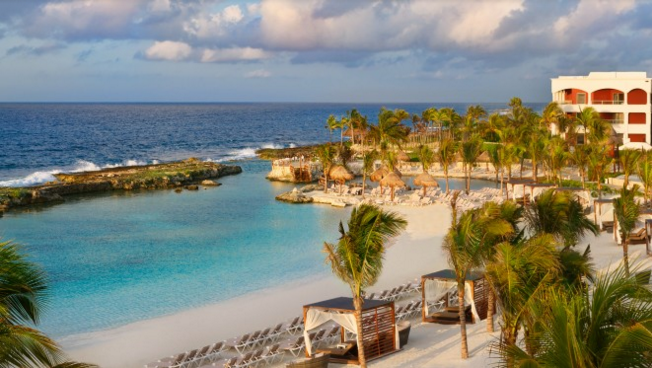 The Hard Rock Riviera Maya is an amazing property! It was just completely renovated, so everything is new and fresh. It's pretty incredible! It uniquely has two sides. To the south is the family-friendly side and to the north is the adults-only side. Adults have full access to both sides. Rooms at Hard Rock include all meals, snacks, drinks, room service, in-room mini bar, wifi and phone calls to the US. We also include the shuttle between the airport and hotel. Just off the azure waters of the Caribbean Sea, the Hard Rock Hotel Riviera Maya is nothing short of the ultimate crowd pleaser. Live it up with world-class shopping and endless style. Hit the Little Big Club™ and teen activities, or channel your inner awesome and head to Heaven — an adults-only expanse with stunning pools, lavish spa treatment rooms, and access to signature golf courses by Jack Nicklaus and Robert von Hagge. Bottom line, it’s all top-shelf.